The practical, modern and environmentally safe way to get rid of scrap wooden pallets. The completely integrated system feeds pallets automatically, removes all nails, screws and staples, and produces a finely ground mulch - in a single pass. No secondary operations of any kind are needed. And it meets all EPA, DEC and other government requirements for the safe disposal of solid waste. Standard 48" wide pallets are placed on the vibrating steel bed, nails and all, and fed into the mouth of the unit where four rows of heat-treated steel hammers "hogerizes" them. 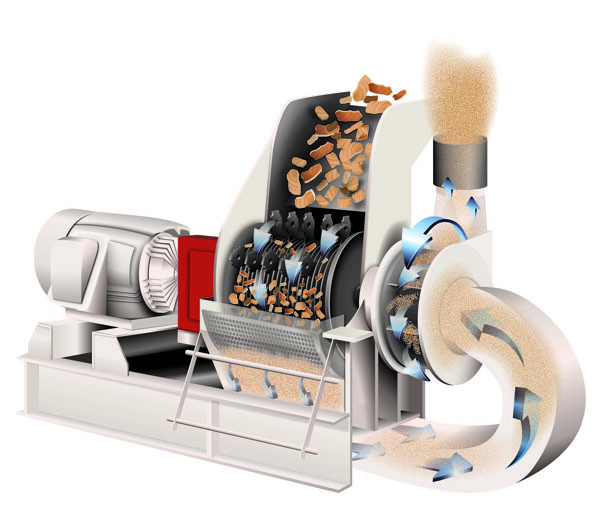 The finely-ground particles, along with the nails and other tramp iron, are sucked into an automatic rotary drum magnetic hump tunnel by a powerful 40-50 HP material handling fan. In a specially-designed automatic rotary drum magnetic hump tunnel, the mixture suddenly changes direction, momentarily reducing its velocity. Permanent plate magnets "reach out" and pull the nails and other metal objects from the flow. The ground wood continues through the fan blades and into a trailer to be hauled away, into storage, or for further processing. We now offers the Model 4235 and Model 3035 Pallet Scrap Grinders, smaller units for processing wooden pallet scrap and other wood scrap materials into a uniform, first quality grind. 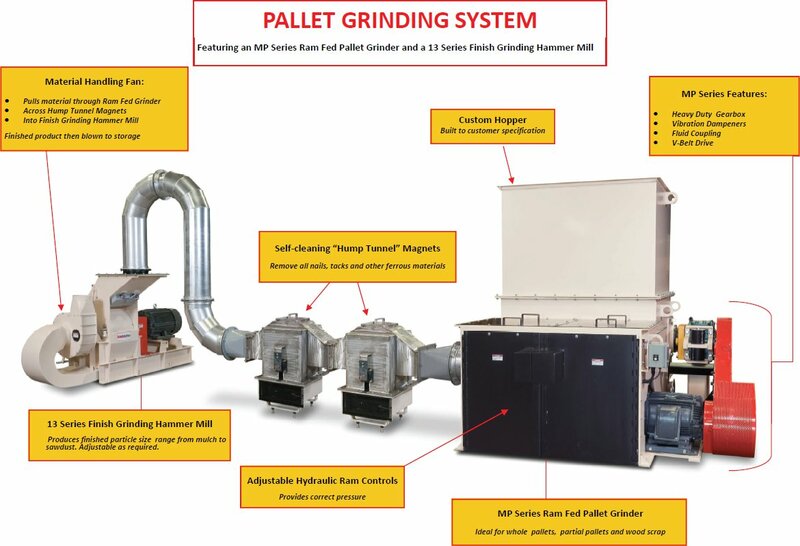 These models are ideal for lumber mills, furniture plants, recycling facilities and other operations for processing trim scrap, cardboard, boxes, paper products and more.